It popped through the door (or rather the mailman handed it to me) a few days ago, and a rainy afternoon seemed a good opportunity to check it out. 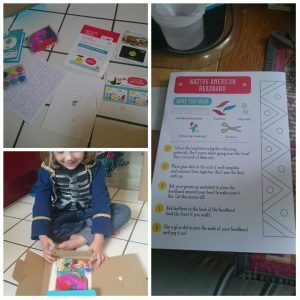 I think this one’s theme was apparently ‘World Travel’, though it happened that the two projects contained in my Petite box were both Native American themed. Once again, the Petite box, which contained two projects. This happened as well for boxes #1 & #2, though this time they didn’t describe the extra as an ‘Extra Special Super Awesome Bonus Craft’. I always thought this seemed a touch hyperbolic, though presumably the idea was that you would feel it’s extra good value as you’re only supposed to get one project and you actually get two. And it’s pretty damn good for four quid. Of course the second project, bonus or not, is generally as great deal simpler than the first, usually involving simply a piece of paper with things printed on it. Not that that’s a bad thing, there’s plenty to be done there. Anyway, I’m getting ahead of myself, so on to the projects. This was pretty cool, firstly because it looked great when finished, and also because it took AGES! As usual, the slim box had great supplies and instructions. 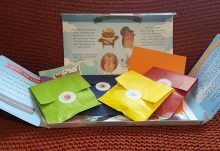 There’s a picture of the contents so you can check them out. A totally reusable tray of watercolour paint was included, so that was definitely a bonus. Basically the Dreamcatcher involved popping out a pre-cut circle, painting it, then threading some wool through the holes using a pink plastic needle. 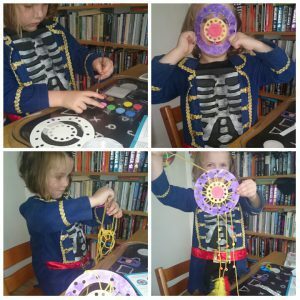 This was a great intro to sewing (hey, I’m actually not going to let a four-year-old near anything metal and pointy), as the holes were big and so you couldn’t miss. And you’d have to be really creative to do any damage with the pink needle. The one thing that was a little tricky was the fact that the wool came in one ENORMOUS length; I didn’t measure it but I’d suspect several meters, and it was a little interesting threading it all through the holes. But then C didn’t seem to mind, and it was a useful way of using up time. Oh, and the paint dried really quickly, which was fab, as little kids lose interest fast when they have to wait around for a hour for something to be ready for the next stage. Then the remaining wool was cut into four lengths, three to attach feathers and beads (which needed to be tied on to look effective) and hung from the bottom of the circle, and one more as a hanging loop. Finally a few star stickers to be added. The low ‘messiness’ factor and medium ‘grown up assistance’ factor, as detailed on the instructions were absolutely correct. Minimal painting chaos, and I did have to help with tying, threading, and unwinding the wool from C when she got herself tangled whilst ‘sewing’ it through the holes. But the whole thing took nearly an hour, which was a bonus in itself. And it looked awesome when finished. This was the ‘sheet of paper’ project. There was a print out of four strips to be painted (fast drying again), cut out, then stuck together with glue dots (provided) and made into a headband. The leftover feathers from the dreamcatcher were then attached at the back. This was fairly quick and easy. C could do almost everything herself, including the cutting out. Thank god for left-handed child’s scissors. It’s a far cry from the crappy ones of my childhood which were totally blunt, never cut anything, and were the most frustrating thing ever. And at school there were never enough pairs to go around. I digress. We did the glue dots together, and then I fitted it to her head and we put it together. We ended up taping the feathers on. C needed a bit more help for that because of all the fluff; feathers and scotch tape are not a good mix. But in the end it looked fab, and see the picture for the finished projects. The ‘World Travel’ leaflet had three more ideas: Mexican Maracas made of empty loo rolls and rice (not a chance, I can see us treading on the stuff for days); Maple Cookies (Canada) pointing to the blog for the recipe (poor Canadians, their culture encapsulated in baked goods); and Ounch Neech, which is a kids’ game from Pakistan, a variation of Tag. Actually pretty interesting, so I’ll be keeping this bit for future reference. It’s probably picky to mention, especially as we only had two out of a possible four projects, but given that both ours were related to Native Americans, plus the Canadian Cookies and Maracas, four out of five were from North and South America. Then there was the random one from Pakistan. So it didn’t really feel like World Travelling, more like Different Cultures (again, poor Canadians). But for children it’s not at all a big deal, I’m just applying some adult cynicism. Apparently the official skill being practiced in this box was ‘Physical Development’; the sewing part of the Dreamcatcher project. OK, good for those who are into box-ticking. Along with the bits was the usual friend referral coupons, and, randomly, a £25 coupon for some food mail-order thing. Now I know that this kind of advertising helps to support small companies like this, so I don’t mind (it went straight in the bin because I can cook). 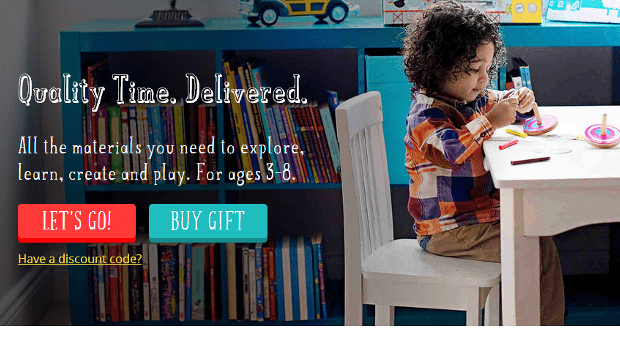 But it was a bit of a non-sequitur, craft box and food coupon? If it had been a coupon for wine I would have understood. 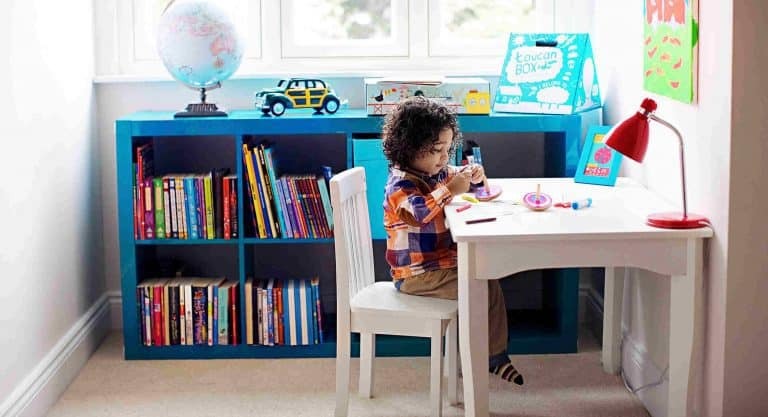 While I don’t know any children in the upper age range for this box, I think it still would keep them happy, though they would be able to do everything with just general supervision. A three year old I suspect would have had some problems with the threading part, but that’s what parents/’grown up assistants’ are for. So in conclusion, another excellent box. Two projects that took more than an hour and a half to complete, which is certainly worth four quid. 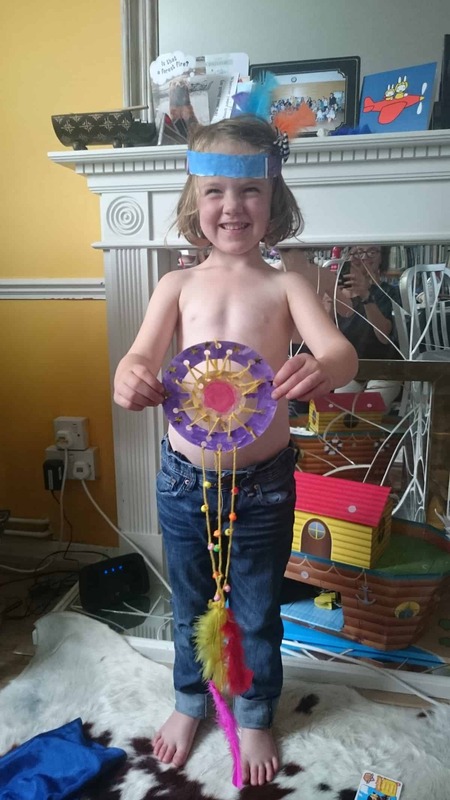 I suspect the headband will disappear rapidly, but the Dreamcatcher is hanging in C’s bedroom window, attached to a space mobile she made a while ago. I received a Petite box, which contained two projects. This happened as well for box #1, though this time the extra was described as an ‘Extra Special Super Awesome Bonus Craft’. I must confess this seemed a touch hyperbolic. I can only assume that the idea is that you will feel it’s extra good value as you’re only supposed to get one project and you actually get two. And it’s pretty damn good for four quid. But anyway, this fortnight’s theme was ‘Medieval’. The two projects were ‘Royal Crown’ and ‘Medieval Finger Puppets’. Once again the box was small and slim (C’s name was still misspelled) and it required a knife to actually unseal it. But presumably kids who are going to do this kind of thing will be pretty well supervised, or at least have parents on hand to get the box open. This was really very nice. There was some nice ribbon, a zigzag template, plastic ‘jewels’, and lovely purple sticky felt. The idea was to use the template to trace and cut the edges, remove the backing, lay the ribbon in the middle and fold it all together. 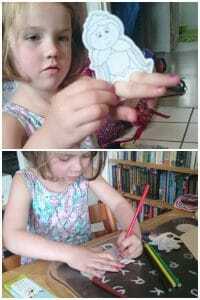 C was fine with tracing the zigzag template, but she wanted me to cut the felt, which was sensible as cutting thickish material is not the same as cutting paper! We did the folding and sticking together, as the sticky backing didn’t allow for mistakes/repositioning. There were supposed to be bits of sticky tape for the jewels, but we couldn’t find them. However this gave me a chance to break out my trusty glue gun (I know, any excuse). I put the glue on the jewels, and C stuck them on. The finished product looked awesome, though it was actually very fast to make, perhaps fifteen minutes. 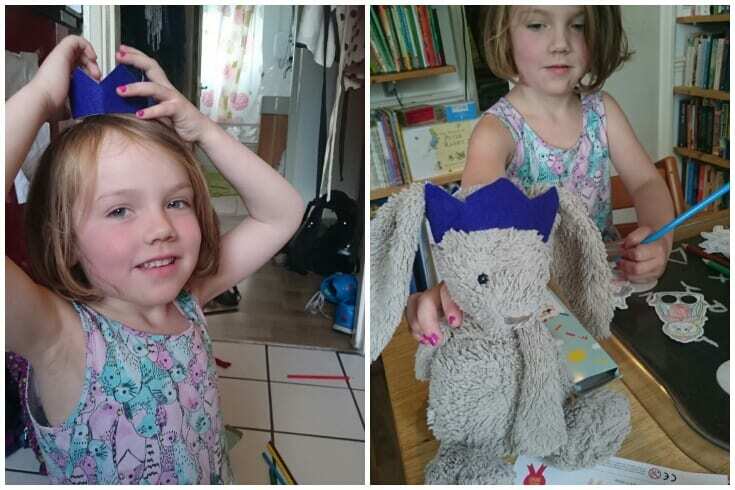 A personal extra bonus for us was that the extra bit of leftover cut-out felt could be made into a crown for C’s favourite toy rabbit. She already has rather an extensive wardrobe, so this was a splendid addition! I’d give this project 9/10, only losing a point because it hardly took any time. These were three cut-out characters, a dragon, a princess, and a queen. The finger holes needed to be popped out, and (very nice) coloured pencils were provided to colour them in. As C loves colouring this was a great success, and lasted considerably more time than the crown. We used them to make up a few stories together, and she had fun walking them around on the table. So actually, though it was extremely simple it worked very well. Also included was a leaflet with a ‘What We Are Learning’ paragraph. Apparently the crown was ‘Science’: a brief paragraph about how gemstones are rocks that are then cut & polished to look shiny. It suggests starting a rock collection, but as I’m sure you know a young child needs little incentive to collect all kinds of crap, so I think this one will be put on one side for a while as we really don’t have space in our small flat for a bunch of rocks. But for older children it’s a great starting point for projects and discussion. The other side of the leaflets listed three more ideas: how to make a Jester Hat; cutting a sword out of the box (covering with tinfoil etc. ); and making ‘Dragon’s Breath Fire Ribbon’, involving coloured ribbons and plastic bracelets. Again, great ideas, but require more stuff than we actually have. But it’s always nice to have extra ideas for more projects (when one can find the time to shop for the stuff of course). Once again, everything was well packed, and the contents were of good quality. Very clear instructions. Nice insert listing contents, instructions, and this time a poster was included, to which you are supposed to add each ‘token’ sticker you get in the box, saving up for extra goodies. Well, I don’t actually remember getting a token sticker in the first box, and knowing that four-year-olds are not susceptible to delayed gratification (not to mention having an insatiable desire to stick stickers on any damn surface they please rather than the place for which they are designed), I’m not sure how successful it will be. But it’s tucked away on a bookshelf for the moment, though who knows if we’ll get around to actually getting any extras. Personally I think a sticker book or card would have been better; posters are frankly annoying as they get lost, tear, and there is no space on the wall for them. But that’s a minor gripe. 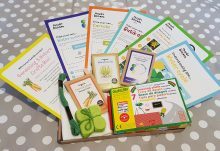 Also is a couple of free box coupons for friend referral, and a booklet describing how the projects support the National Curriculum/EYFS Frameworks. The latter is useful, though personally I don’t like box-ticking, but as we’re starting home ed next year I’m going to be keeping this for further reference. All in all, another great box. It took a bit less time than the last one, but again for four quid it’s a bargain. I needed to assist a little more with this one, but older kids would be fine. C is perhaps slightly too young to really appreciate the Medieval theme, but I still enjoy the further inspiration it provides. And it’s worth remembering these things for the future! As before, I’d certainly recommend this and I would say that it made a difference that there were actually two projects. The crown is very nice (definitely something which will be kept and added to the dress-up collection) but took very little time to complete. If that had been the only thing then it would definitely have felt a little stingy, as sometimes maximising time can take priority over maximising quality! But the finger puppet addition was perfect. So far, the two for one project thing is two for two, so we will see what happens next! 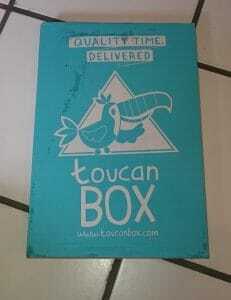 So today’s afternoon craft fun was courtesy of Toucan Box. I received a Petite box, which actually contained two projects instead of the usual one. This pleased me. The projects were called ‘Treasure Map and Parrot Partner’. Presumably this fortnights theme was Pirates, and larger boxes contain additional projects with the same theme. To give you context of who this was actually for, I have one daughter C, age 4 ½, and she loves drawing, painting and crafting. I’m not telling you my age, but I since having a child I have discovered that I also like playing around with glue, paints and sparkly things. 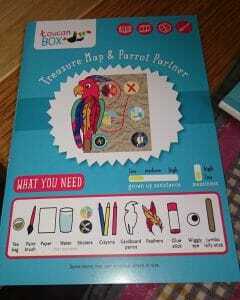 I’ve even bought a glue gun, which is ace. But I digress. OK, so to the box. The box itself was well presented; it was small so probably would have fitted through the mailbox. The box was a nice colour and well decorated and was addressed to my daughter, though her name was spelled incorrectly. (OK, it’s a weird name, it happens all the time so I’ll forgive them. I’m also going to let them know and they should correct it. Watch this space.) Also the mailing label was stuck over the flap and I had to use a knife to open it up. Not one for the kids to try, but again, it wasn’t really a problem. There were a good quantity of items in the box (makes you feel you’ve got your money’s worth), and I had to hustle to get a picture before C began exploring! She’s pretty headlong about this kind of thing, but I managed to persuade her to read the instructions to see what’s in the box and what we actually had to do. I’m not going to list everything because it’s in the pictures – the ‘What You Need’ leaflet and all the contents we lined up to check they were all there. Rather like when you buy something from Ikea and you check you’ve got all the pegs and screws before putting it together. Well I do anyway. The parrot was pre-cut and came with four crayons (red, blue, green, and yellow, good parrot colours). The crayons were a bit cheap, but for four quid they ain’t gonna be Crayola. They worked just fine, though C was slightly perplexed by the bumpiness of the cardboard. We looked at some pictures of parrots for inspiration (thank you Google) and she happily coloured away. 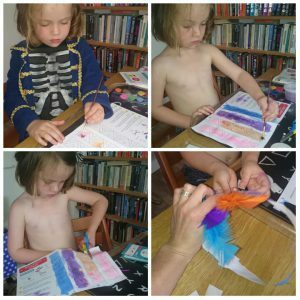 After the colouring came the sticking – always a popular activity! 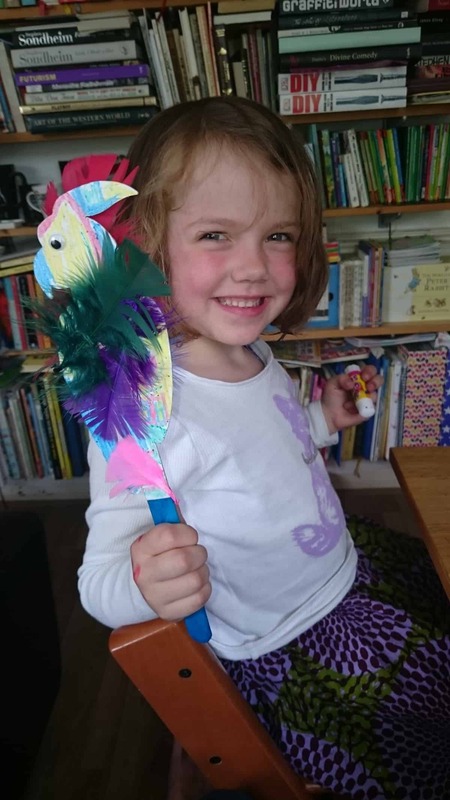 A generous quantity of feathers were provided so we had a few left over for future craft fun, although we were slightly disappointed that there was only one googly eye, as she was planning on a double-sided parrot. However eye, feathers, and stick were duly stuck and the parrot was proclaimed a success. 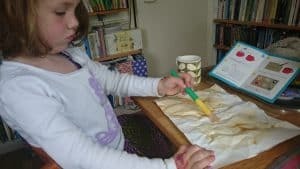 When the tea was satisfyingly brown and tannic (and incidentally tasted disgusting, according to C; yes, I let her try it), it was time to paint the treasure map. 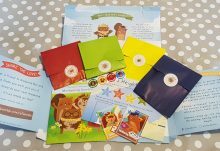 The paper provided was very thick, which was good for robustness but meant that it was far too thick for little hands to crumple. But at least it gave me something to do. The large brush was great, though C wasn’t convinced the tea paint was dark enough. However I managed to persuade her it was ok and also managed to persuade her to paint the whole thing rather than swirly patterns (it took some time to cover the whole page). I didn’t want to wait an age for it to dry, so I put it in the top oven on the very lowest setting with the door open. It worked. 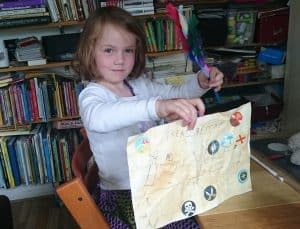 During the drying time we Googled treasure maps, and while I wouldn’t exactly say she was inspired, at least we got the issue of paper colour sorted. 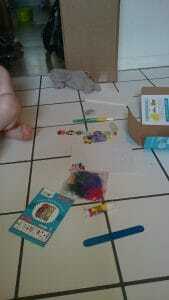 The paper was dry, and now came the sticker part (C adores stickers). I’m not sure if she had a plan of any kind, and she didn’t really get the part about making a path to follow, but stickers were stuck, a couple of doodles and the title were added, and the map was complete! 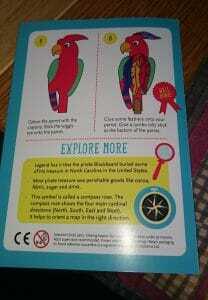 One teeny problem: because of the wax crayons, the googly eye would not stay on the parrot once the glue dried. But it’s hardly a deal breaker. 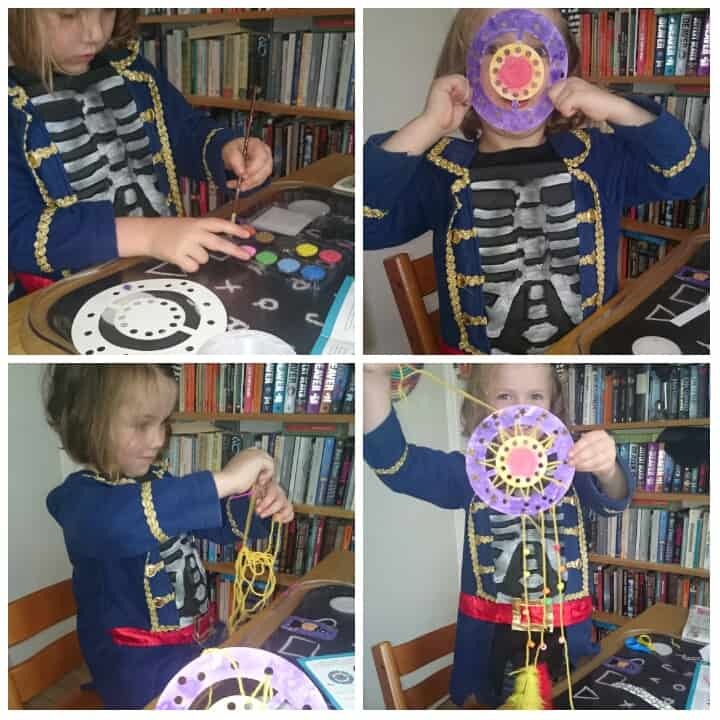 This would have been an opportunity to get my glue gun out, but I feared it would lead to an extended crafting session, and frankly, it was getting close to supper time. Along with the project supplies there was an extra bit of paper with some more ideas on, things to talk about, plus a couple suggestions for indoor and outdoor games. While I wasn’t quite convinced by the notion of painting balled up newspaper black to make cannonballs, it was great to have extra ideas. There was also a leaflet describing what is obviously in the larger project boxes (a pirate chest and a couple other things) to tempt you to go for the bigger, better boxes. Or if your kids read it to get them to harness pester power to get you to buy them more. I didn’t let C see it. The actual parental participation required is pretty limited, which is great. My contribution consisted of paper-crumpling, hot water pouring, and googling. Oh, and stopping C from sticking the stickers on her clothes rather than on the map. C needed some guidance because she’s four and a half and isn’t keen on following instructions. I would think that 6 – 8 year olds could do everything just fine on their own, with perhaps a distant parental eye in case of fire or flood. Three year olds would need more help. So, for £3.95 I would say this was excellent value. Both projects took about an hour altogether to complete, which is about right for that age. The instructions are very clear, C could read them easily, and there were good pictures to follow too. I’d certainly recommend this, though I’d actually be curious to see the larger boxes to be able to assess the value and variety, and also how much time it all takes. I like the idea of having several projects that could be spread out over a day or a couple of days. Four quid is fine for an hour’s distraction and there was just the right balance of preparation (almost none) and creativity (almost all). Also everything was of nice quality, nothing felt cheap or tacky. I would say that it made a difference that there were actually two projects. If there has only been one I would have thought it was a bit skimpy, as just one would have taken a half hour max. I can’t say yet if this is usual, as according to the website the Petite version is one project only. However perhaps the single projects are a bit more involved and time-consuming and as these were quite simple they thought best to have two! If so, good call.